Lahore: The killing of four unarmed citizens in an alleged encounter by Counter Terrorism Department (CTD) in Sahiwal has triggered a nationwide outcry, with prime minister also ordering an inquiry and promising action against anyone found guilty. Talking to media, Ehtesham, the brother of Zeeshan, who among the four people killed in a shady encounter on a highway in the Qadirabad area of Sahiwal district on Saturday, said the Punjab government had offered 20 million rupees ($144,000) compensation for the killings. “I told the government ‘I’m ready to give you back 25 million rupees in return for justice’,” he said. Chief Minister Punjab, Usman Buzdar, said the provincial government will give the aggrieved family Rs 20 million in compensation. “We don’t want money,” he was quoted as saying by the Reuters. “Zeeshan had never even seen the inside of a police station,” Ehtesham said. “He was so scared of insects that he would jump up on the charpoy when he spotted them on the ground,” he continued. The brother asked how such a man could be labelled a terrorist. “Even our mother is being labelled as the one who gave birth to a terrorist,” he added. Ehtesham added that he himself was a part of the Dolphin Squad. “When I joined the force, I submitted a copy of my brother’s CNIC,” he said. “If reports of him being a terrorist are true, why did the department concerned give me the job,” he questioned. The killings triggered protests on Sunday in Lahore and renewed a debate over extra-judicial killings and police impunity in the where such encounters are not uncommon. Prime Minister Imran Khan said he was “shocked at seeing the traumatized children who saw their parents shot before their eyes”, and promised the state would care for the survivors. “The grief & anger … is understandable & justified,” PM Khan tweeted on Monday, referring to the public outrage. The Sahiwal incident sent shock waves across the country after one of the surviving children who witnessed the episode refuted the version of the CTD. The CTD has identified one of the deceased as Zeeshan. The department says he was wanted in several cases of crime, including the kidnapping of Ali Haider Gilani, the son of former premier Yousuf Raza Gilani, and several American citizens. It also says he was the deputy chief of a banned outfit. But reports emerged that the man killed by the CTD ran a computer shop and had no criminal background. Two men and two women were killed in the incident. They were identified as Khalil, Nabila, Zeeshan and Areeba, who was 14 years old. 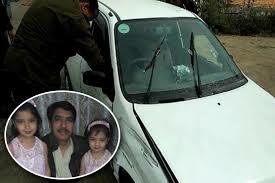 Khalil and Nabila were the parents of the injured boy. The deceased hailed from Kot Lakhpat. It may be noted here that the CTD has changed its versions couple of times since the issue caught spotlight on all the TV channels.